If you enjoy gardening, it’s never too early to start thinking about next year’s growing season. [Jared Bouck] over at InventGeek loves his tomatoes, but the slow grow rates of his dirt-bound plants were less than impressive. To get things moving faster, he created a low-cost aeroponics system that uses ultrasonic mist to produce some pretty impressive results. The construction process of this ultrasonic aeroponics rig looks dead simple, and [Jared] said that he had everything assembled in about half an hour. A cheap ultrasonic mister was mounted in the bottom of a plastic tub, and holes were cut in the tub’s lid to make room for his growing baskets. 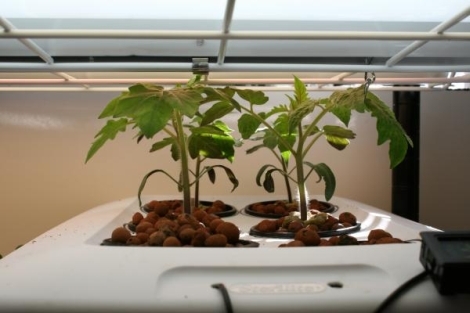 Tomato seedlings were wrapped in rock wool and placed in a clay growing medium, suspended over the water bath. The mister was turned on, and after just a few days, the results were obvious. In the last step of his tutorial, he compares his aeroponically grown plant to one grown in soil – the difference is unbelievable. Considering how reasonably priced his setup is, it seems like a no-brainer to start growing your entire vegetable garden this way.